Databricks Runtime is the set of core components that run on the clusters managed by Databricks. It includes Apache Spark but also adds a number of components and updates that substantially improve the usability, performance, and security of big data analytics. You can choose from among many supported runtime versions when you create a cluster. Databricks Delta: a next-generation engine built on top of Apache Spark that provides ACID transactions, optimized layouts and indexes, and execution engine improvements for building data pipelines. The Databricks Runtime Release Notes list the library versions included in each runtime version. New versions of Databricks Runtime are released on a regular basis. Major Releases are represented by an increment to the version number that precedes the decimal point (the jump from 3.5 to 4.0, for example). They are released when there are major changes, some of which may not be backwards-compatible. Feature Releases are represented by an increment to the version number that follows the decimal point (the jump from 3.4 to 3.5, for example). Each major release includes multiple feature releases. Feature releases are always backwards compatible with previous releases within their major release. Long Term Support releases are represented by an “-LTS” suffix (for example, 3.5-LTS) and are the “canonical” feature version of the major release, for which we provide two full years of support. We recommend these releases for your production jobs. See the deprecation policy described below for more information. Beta Support SLAs are not applicable. For more information, see Databricks Runtime releases. Full Support Major stability and security fixes are backported. New features will be available in the next version. Marked for deprecation Version will be deprecated (unsupported) soon. This phase will last no less than 3 months, although the actual duration will vary depending on version type. See Deprecation policy for more information. Sunset Typically, Databricks removes a version completely from the API only when its usage drops to 0. Your scheduled workloads are therefore guaranteed to run properly regardless of the deprecation schedule. If we make exceptions to this rule, we will give ample notice. The Databricks deprecation policy depends on version type. We give 4 months notice before deprecating a feature version. After 4 months from the deprecation announcement, we remove the version from the Create Cluster and Edit Cluster pages. We do not backport fixes and we provide no support for those versions. You can continue to create clusters from the API if you have automated jobs running. For some major versions, we identify a pinned version for which we offer two years of support from the date of release. After two years, we mark the LTS version for deprecation, deprecating it one year later. For example, 3.5.x-scala2.10 and 4.1.x-gpu-scala2.11. 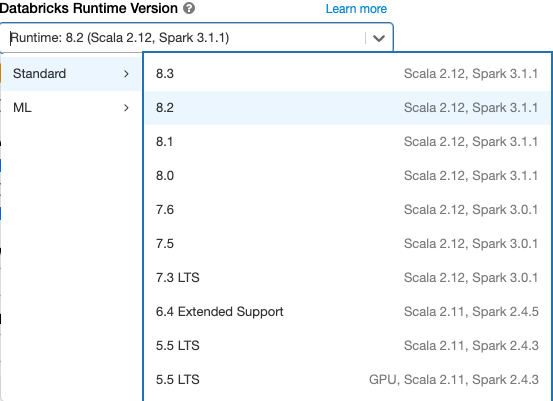 The List of releases tables map Databricks Runtime versions to the Spark version contained in the Runtime.